I am one of the eight founding members of the recently created Radical English Alliance (Nov. 2012), a group of like-minded EFL/ESL teachers from six countries, who came together online and then met face-to-face for the first time in Lydbury, England. Each of us has a strategy to accelerate and simplify different aspects of learning English for different levels of students. My simple system is based on making pronunciation easy for Portuguese learners of English. I carried it out for six years with 5th to 9th grade EFLers (beginners to intermediate) in a public school in the greater Lisbon area, Portugal, and it worked wonders. I'm currently working on an e-dictionary titled Pronunciation Made Easy. 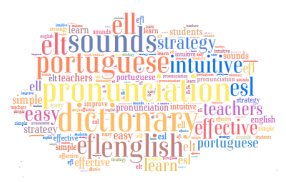 It includes over 3,000 words used by EFL learners, their pronunciation based on my simple system and meaning in Portuguese. I'll also create activities for students. Do come back in a couple of weeks for an update.